Collection every Wednesday. Please have waste curbside by 7:00 AM. Texas Pride Disposal will provide each household with a trash cart. Overflow may be placed in old cans or bags. Additional, lost, or stolen carts can be purchased or replaced for $75.00 by contacting the Water District. Collection every Wednesday. Have your recyclables ready by 7:00 AM. 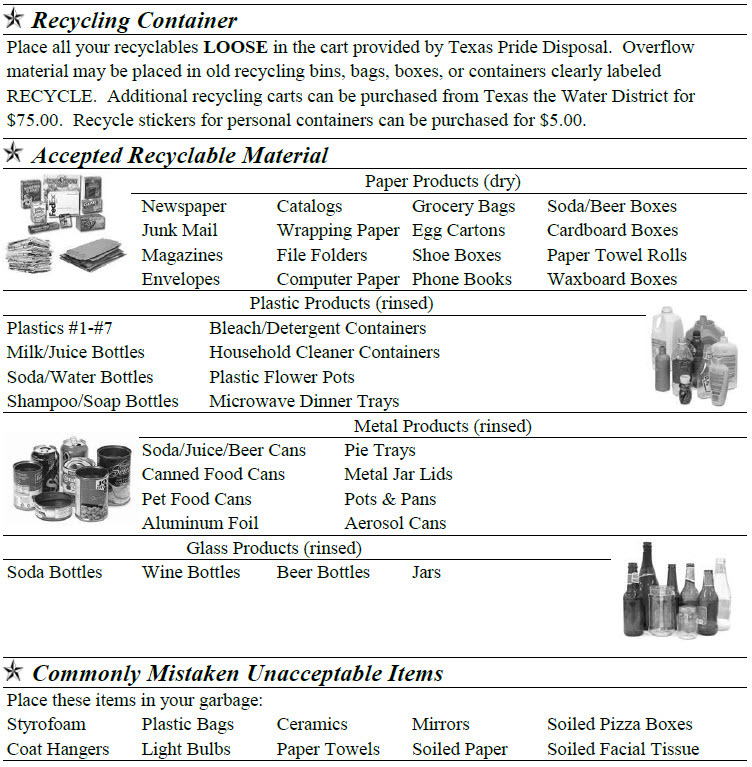 Place all your recyclables LOOSE in the cart provided by Texas Pride Disposal. Overflow material may be placed in old recycling bins, bags, boxes, or containers clearly labeled RECYCLE. Additional recycling carts can be purchased from Texas the Water District for$75.00. Recycle stickers for personal containers can be purchased for $5.00. In the event that your service day falls on a holiday, collection will occur on the Thursday following the holiday.